The nature of Minimates, pretty much since the Marvel ones got on the scene in 2003, has been to have one flagship line, and a secondary line that’s still doing a lot of the business. For 99% of the brand’s run, Marvel’s been the flagship (apart from a brief dark period for the line, which resulted in DC having the upper hand for about a year), but that secondary slot has filtered its way through a few other properties. From 2009 to 2011, that secondary property was Ghostbusters. Today, I’m looking at the set that introduced the property! 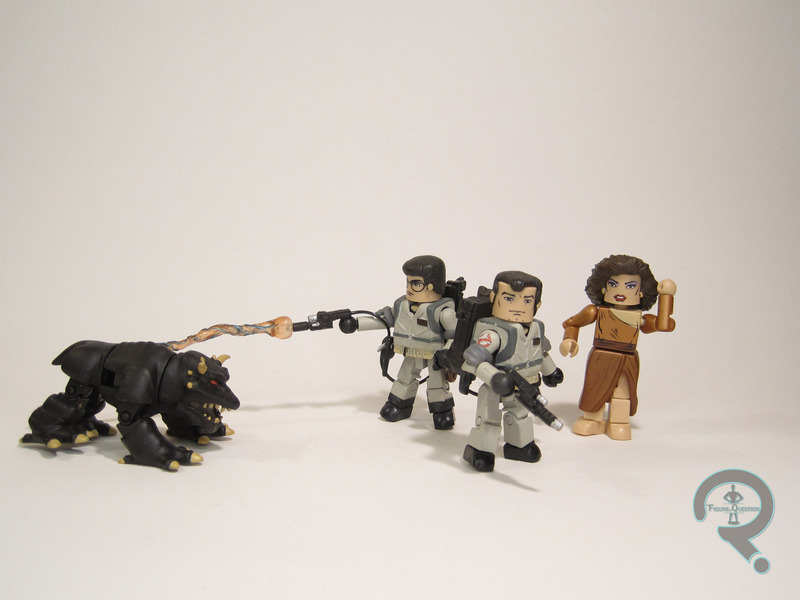 Venkman, Spengler, Dana, and Louis were the first boxed set, and the first official entry in DST’s Ghostbuster Minimates (TRU’s exclusive two-packs hit just days later, though). All four figures are, of course, based on the first film, and the set is designed to pair off with the second boxed set, which rounded out the main team, and gave us the two remaining villains. Venkman is arguably the lead character of Ghostbusters, and is the face of the group, so his placement in the first set is definitely sensible. Plus, it gave DST an extra leg-up when comparing their assortment to Mattel’s own figures, where Venkman wound up as the fifth figure in the line, causing a degree of controversy about whether he’d actually show up at all. No worries about that in this line-up. The figure uses the usual ‘mate body as a starting point, so he’s about 2 1/4 inches tall and has the usual 14 points of articulation. Venkman was built using add-ons for his hair, torso/proton pack, and elbow pads. All of them were new pieces to this set, but they’ve been subsequently re-used a number of times, notably on the “I Love This City” version of Venkman, who used everything but the torso piece. The torso piece is kind of noteworthy, as it’s really the one thing that held these releases back, and it’s definitely the one thing that signifies them as out of date amongst newer offerings. The bulked up nature just looks off, since the ‘busters were just average joes. Still, the piece does exhibit a nice selection of details, especially on the proton pack. The paintwork on Peter is fairly decent. The earlier ‘busters used a prop-accurate grey for their jumpsuits, which doesn’t quite match the on-screen appearance but is *technically* more accurate. 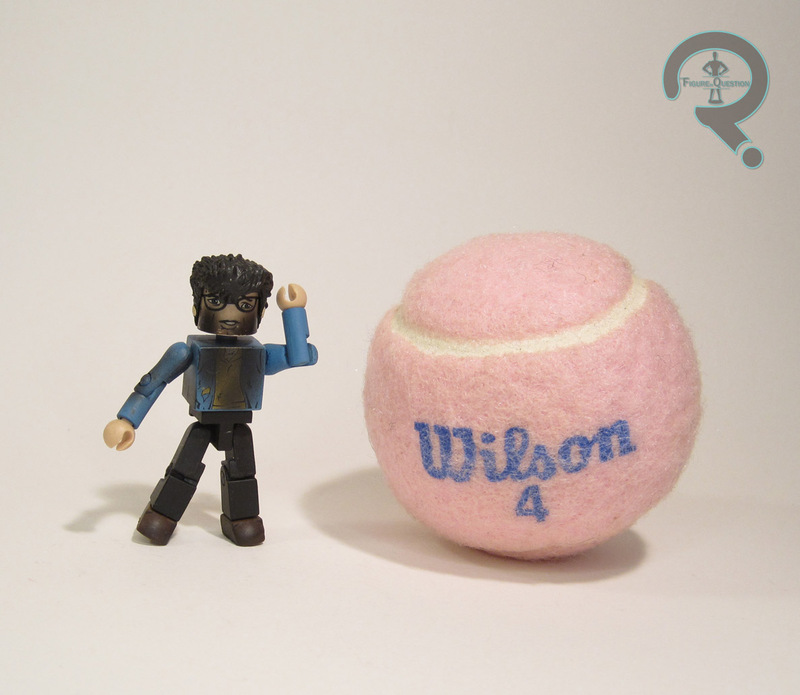 His face has a passable Murray likeness. It’s not as spot-on as some of the later offerings, but it’s not bad. Venkman is packed with his radio (which can be mounted on his belt) as well as an energy stream effect for his neutrino wand. My personal favorite ‘buster, Egon is the second member of the team represented in this set. Harold Ramis had been doing a lot of rounds talking about the production of the movie right around this time, so he, and by extension, Egon, were quite in the spotlight. Egon is very similar to Venkman in construction, just with a different hair piece. It’s the weakest of the new parts for this set; it’s just too reserved for Egon’s distinctive pompadour from the movies. That’s probably why it was replaced fairly quickly as the line progressed. Egon’s paintwork is once again fairly similar to Venkman’s, though with the obvious change-up for the face, as well as extra detailing for his boots. Egon is packed with his PKE meter (again, belt mountable), and another energy stream effect piece. The central plot of the first film (and the second film, for that matter) is driven by Sigourney Weaver’s Dana Barret, who made her toy debut here. She’s seen here decked out in her garb from after she’s possessed by Zuul, which is really the most distinctive of her looks from the film. She uses add-ons for her hair and skirt. Both were new to this figure, and, apart from a single re-use on the hair for the second Dana, they’re remained unique to her. They do a good job of replicating her film design, and are nicely sculpted. The paintwork is fairly decently handled. The Weaver likeness is actually better than the Aliens line gave us, and the metallic coloring on the dress is sharp looking. That said, there’s a slight misprint on the chest, so the coloring doesn’t quite match up with the printed lines. It was a problem going back to the prototype and is present on the whole production of Danas. Dana’s neighbor Louis Tully was a part originally written for John Candy, who envisioned him as husky Russian man. For the final film, the part actually went to fellow SCTV alum Rick Moranis, whose nerdy, eccentric doormat was one of the film’s most distinctive characters. The Minimate is an early instance of a figure pulling double duty, and getting us two distinct looks. He’s packaged as a Terror Dog, and makes use of seven sculpted add-on pieces, for his head, torso, pelvis, and each of his feet. It’s actually a pretty faithful recreation of the design from the movie. Take off the head, torso and pelvis, and swap out the front legs for the included arms, and you can turn him into a rather disheveled Luis Tully. And, if you have a spare head, torso, and legs laying around, you can even display both of them at the same time. I grabbed this set new from Cosmic Comix back when it was released. I’ve been a fan of Ghostbusters for a long time, and I’d even been contemplating picking up Kubrick’s announced line before DST showed off theirs. Subsequent releases of Peter and Egon have supplanted these two, but Louis and Dana can’t be beat, and this a pretty fun set all around.